Over the past years we have sold the ETE plate to individual consumers. First as a small ceramic series, produced by a social enterprise. Than, after our crowdfunding campaign (2015) we scaled up to a more environmental-friendly version and sold our high quality bamboo fiber ETE plate. We have sold over 2000 pieces and they are in use in more than 24 countries! However, for us it was not sustainable to keep selling the ETE Plate to individuals and we had to close our shop in 2017. We do however still sell in large quantities (1000+). Read more about our business to business offer below! Do It Yourself ETE Plate! For individuals, we now encourage you to make your own ETE plates! Though we like the original ETE plate best, we want everyone to be able to eat the right portions. Since we cannot sell individual plates anymore, we want you to create your own ETE plate. 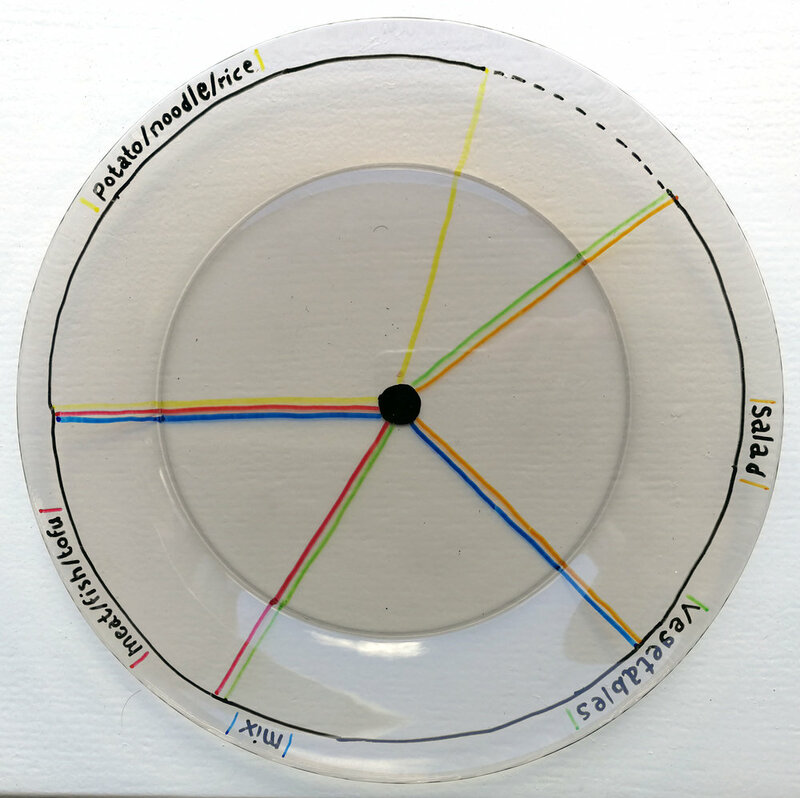 The easiest is to take a glass plate and use our template for a glass plate to make your own. When using glass you will paint the bottom of the plate; ensuring that your food stays safe no matter what paint you use! When you only have a ceramic plate at hand you can download a template for a ceramic plate here. Do take note that with this template you need to ensure your porcelain paint is food safe as your food will touch the paint! Why not use the ETE Plate in an industrial setting such as your staff canteen? Our test at KK Hospital in Singapore proves the professional level of ETE; even after being washed daily in industrial dishwashers for over a year, the ETE Plates remain crisp and clear. There's no sign of wear & tear nor curry stains to blur your portion control; even though ETE conquers the hottest Singaporean curries daily! Employees must make a bunch of decisions everyday, but each frivolous decision takes up time and energy that could be better spent on critical work-related tasks. It’s why Albert Einstein is nearly always pictured wearing a gray suit and why Steve Jobs always wore a black turtleneck. Simply put, simplifying little daily decisions can boost productivity. The ETE plate has proven to nudge employees to eat more balanced meals. Whether you are a large organisation or a corporate health provider, contact us to inquire about tailor made solutions! "ETE helps employees to clearly see what is the right balance for them without making it hard to follow the guidelines. Many meals can be served up on the ETE plate; meals in which proteins and veggies are mixed or separated, vegetarian meals or glutenfree meals: ETE allows flexibility!" ETE Plates are made from a mixture of bamboo fibre (50%), cornstarch (20%) and melamine and are of high quality. If you let the ETE Plate slip through your hands, no worries: the ETE Plate won't chip or break! We even tried standing on them upside down; not one single crack. ETE will last you a lifetime.